Turns out my self-control regarding cookies is kinda non-existent these days. I think it’s because I haven’t really grocery shopped. I bought berries and then didn’t make jam. I bought milk, but no cereal. I have teeny waffles in the freezer, but no peanut butter. I’ve been eating cookies for breakfast and sometimes as a lunch appetizer, and occasionally an after-run reward. I’m pretty glad (or not so glad) that there’s only one cookie left in the house because you see, as a kid I’d eat 4 cookies before dinner! And sometimes, my inner pre-teen-sweet-tooth-self just wants to get full off of chocolate chip goodness. If that’s wrong, I don’t want to be right. Although there is part of me that wants to try not to eat any sugar for a week. Ya know, give my bod a break. If I can take a breather from beers and caffeine now and then, why not sugar, right? (What am I saying right now? I’m trying to get you guys to make these cookies and I’m all “Let’s take a break from sugar.” I’m all over the place!) The fact of the matter is that these cookies are really good, and they make exactly a dozen* so that’s pretty cool. *I made them twice in one week. The first time the batch made 13, and the second time 11. I have confidence you’ll be able to make 12 exactly, but if you end up with a rando’ number, try not to get too upset about it. 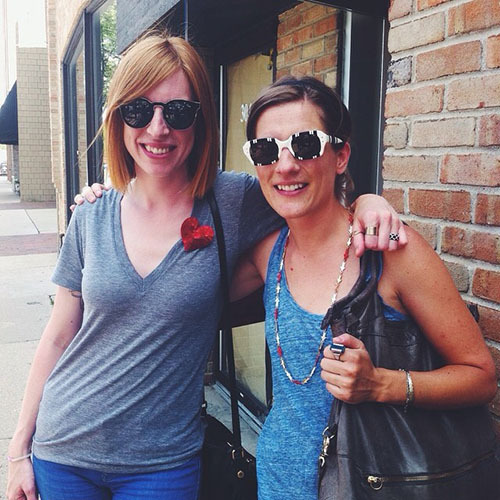 I got lunch with Tifamade! It totally made my month. Peanut butter on your waffles? I thought only my husband did that! These look delicious. 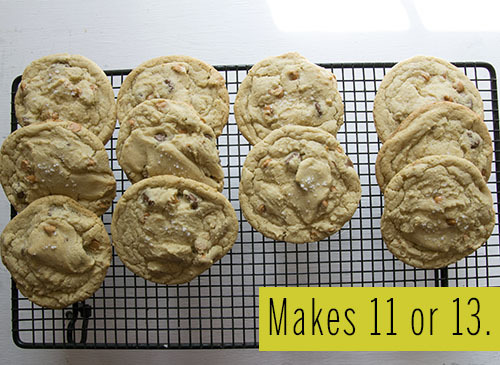 I totally lack self control too but hey, if the recipe makes 11 or 13 no one will ever know when there isn’t an even dozen. I’m thinking I need to go on a sugar cleanse for a week right now, too. I think I’ve got to finish my book first, but as soon as I’m there, it’s all gone! but these cookies are telling me not to. why? These look lovely..and you know me..it has to LOOK delish for me to make it!!! AND not only the cookies look good..I want to get one of those <3 pins you love to wear.. so cute! I, too, have thought about taking a break from sugar. 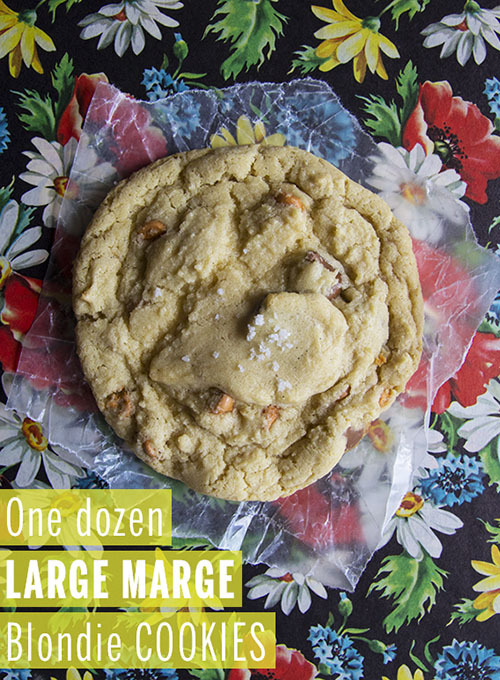 But then I see cookies like these and I’m all, “Ummmmm I’ll wait til next week.” Large Marge cookies FTW! I flipping love the name of these cookies! They look and sound fantastic too! It’s so nice to know that I’m not the only craving cookies for breakfast, lunch and dinner. Cookies look awesome!!! Oh but taking a break from sugar makes it taste that much better when you eat it again. Not that I’m speaking from experience or anything 😉 Blondie cookies sound like the best cookies ever! The salt garnish just nails it! Those are beautiful! This may be the stupidest question – but I’m using 1/2 cup sticks of butter, so should I use 1 and 1/4 STICKS or 1 and 1/4 CUPS?